According to a report from video hosting and analytics startup Wistia, nearly 20% of all Internet users in the US are unable to watch HD video (~2 Mbps), on any device. The study, which resulted when Wistia pulled data from some 500 million viewing sessions, sought to find out what users are actually experiencing. These are approximations, mind you, but given the sample size, this information is worth a look. Remember that actual download speeds can be very different than stated connection speeds. Clearly, users on dialup and mobile networks are bound to run into problems when trying to stream HD video, but Wistia found that even with high speed connections, there can still be major variances in download speeds anytime that connection is shared. Once again, although this information feels obvious, pinning down an actual statistic reveals a lot about the current state of US Internet users. 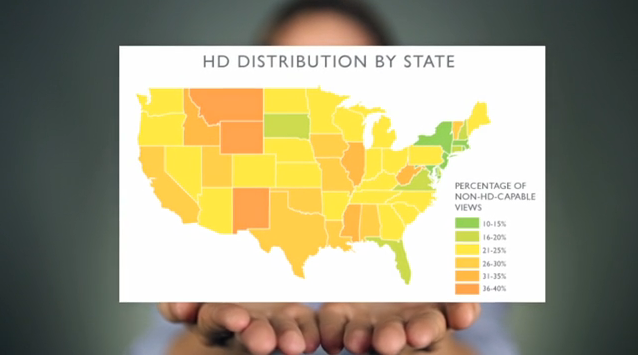 Diving deeper, according to the data, northeastern US has the highest capability of viewing HD content, while states such as Montana and Wyoming averaged siginificantly lower, with as little as 60% of the browsing population able to view HD. A portion of this study directly targeted the workplace, and so, after gathering data from “25 well-established companies and organizations,” Wistia found that over 25% of users in these workplaces couldn’t watch streaming HD video. These organizations were identiﬁed by publicly available IP address information, but we have chosen to report this data by organization type rather than name. This list includes internet ﬁrms, universities, Fortune 500 companies, government agencies and technology companies. As far as what you should be taking away from this study, consider this: services like YouTube offer users the capability to lower their streaming quality, and other services even auto detect speeds automatically, but many self-hosted solutions push HD and fail entirely. In other words, HD video is lovely, but it can’t be the only thing you’re pushing as a business.